Mun finally joined the 21st club!!!! 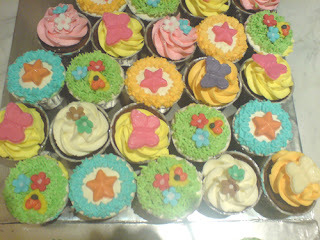 Pastries & cupcakes were served at the parties.. 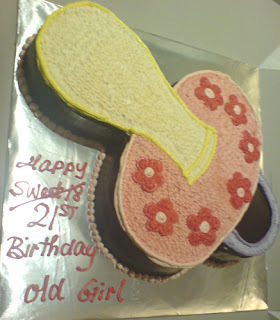 Cute sia...hehehehe!Who will bear to eat it? 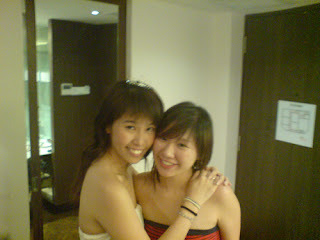 Me & Mun, the birthday girl!!! We were pretty late for the party as we went shopping for her gift..
Super difficult to buy lo..
Actually want to keep for myself though.. Since we were rushing all the time..
We did not have time to write the card..
We hid ourselves in the spacious washroom & write.. Knew Jeremy since I was 14.. He was such a cute fifteen-year-old boy then.. Into such a horny guy..
Why horny..later you will know.. 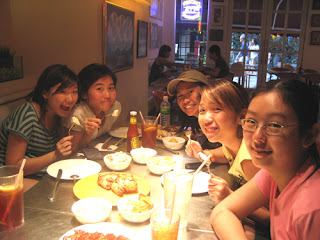 In fact, this group of friends all si bei HORNY one.. But they are one fun bunch! 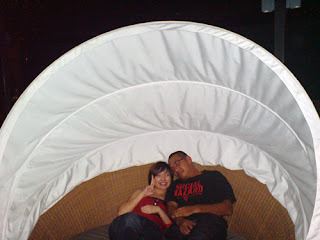 We went up to the rooftop to take a breeze..
And the view is beautiful lo!!!! 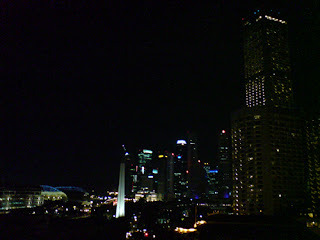 In fact, the rooftop look damn ZAI lo! Got leaf-shaped benches, rotating couch, bar table and a small pool.. The pool look scary..it is designed to be built to the edge of the roof...like will swim off the building any time..
One of the rotating couch...with jeremy..
We were saying the rooftop is like for sexual purpose one lo..
Hope i can come again with my dear for special occasion!!!! Jio by junsheng to attend. Got FREE Food so of coz, I will attend lahz.. The place is filled up with police officers. 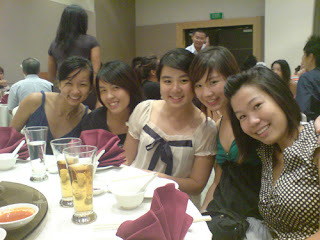 Bo bian, our SM Goh will be at the dinner too. That y..dressed up abit but heng never overdressed..
Din really see much familar face, except Junsheng & Jiaying who were at the registration booth..
No one from my table has arrived lo.. 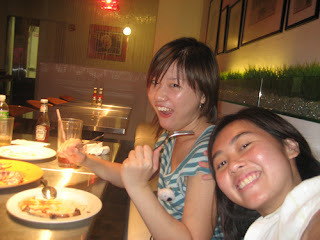 The food was damn good la..
Too bad din take photo..was too paiseh to take.. 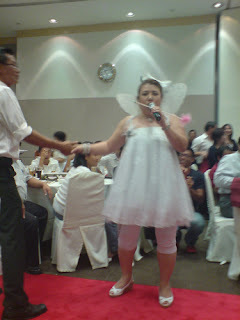 There was performances from artistes and even an auction session.. The Auction is mainly to raise fund for SDBA.. The item is a pair of white paddle and black paddle..
WAs fun bidding..Cher joined in the bidding too!neaarly got it but...too bad! The paddles landed up with the VIPs..at $8888 each pair..with SM GOH signature & photo taken..
Liu Ling Ling from 881 appeared in her fairy costume! 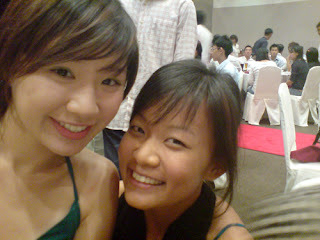 She was damn cute lo! bringing out the rowdiness of the crowd..
She even walked into the crowd and started dancing with an old man.. Think she kana groped by the old man.. Well...Many of us Sing along with her..& were laughing at her jokes..
At least something beside the food made our attendance worthwhile!!!!! We went to Villa Bali to have a drink. sucky drink. Saw this car outside Villa Bali.. According to medical report, there is an increasing trend among men of 20s and 30s facing problem with their xiaodi..
Their xiaodi cannot stand which is "ERECTILE DYSFUNCTION" in scientific term la..
Erectile dysfunction is actually an illness that usually occur among older men..
And among all, there is a common habit. All of them sleep late. All of them did not have enough sleep. In fact, erectile dysfunction might lead to other terminal illness.. So gurls ..if u don't want ur partners to get it..ask them to sleep more..
Who will wake up early just to torture themselves with a 10-km run? Only 8000plus of healthy living girls, ladies and women!!! 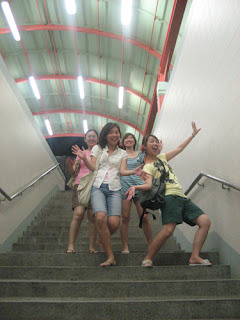 Together with Yixin, my hao jiemei aka canoeist partner..
Me n yixin were so excited lo...hahahaha! But right from the start, I feel a slight pain at my knee.. Honestly, I did not train for the run at all! Got train..also is jog 3km with James nia...hahahaha! 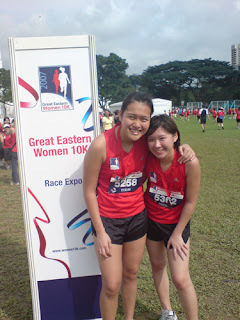 At least Yixin still jog 10km last month..
Of coz dying for the rest of the 7km lah! As I jog..my left leg felt the impact..especially on my ankle..n my inner thigh..
Like a superslow moving turtle..
Yixin, being a regular jogger..jog dunno till whr le..
i super sian lo..counting down to the end of the run..
Was so delighted to see the signboard showing the no of kilometres i jog lo..
when I see 8km..i so excited lo! I ran abit faster...n when reached the last 1km..faster abit..n 500m..
And actually someone was competing w me to the finishing line.. But my timing lousy la..
Thnx to my deproving stamina n old injury.. I cannot even walk straight...anytime can collaspe.. But still strong enuff for pictures!!! Let me check if this medal is made of real gd stuff! 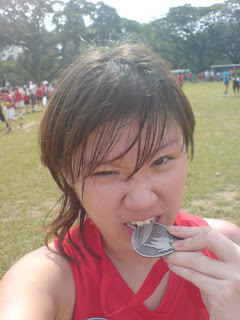 It might be damn tiring but the feeling of completion is..
Maybe next year I go for the 21km? Heng..the sky bright bright. Not a single drop of raindrop. If not, we the westerners will be cursing n swearing..
Rudith & Cheryl reached there 1st. Hence, they started off their cycling 1st. 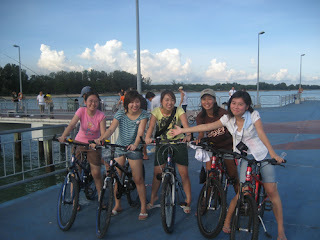 We coordinated with each other in order to cycle in the same direction; toward Bedok Jetty. 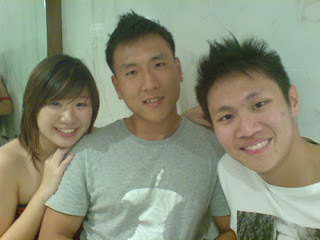 Me, Boon Kee & Rainus keep cycling and cycling..at top speed so as to catch up with Rud & Cher.. They were nowhere to be seen! We passed by many clubs. See many things though. See kids learning roller-blading, kids soccer, old folks doing meditation, wakeboarding, tamiya car racing blah blah.. Along the way, I risked my life to cycle with Rainus. She is bad w bike..she nearly bang into me like 2 to 3times? Just as we reached the ending point, Cher called. Me: At the end lo..
Cher: why never see u all? 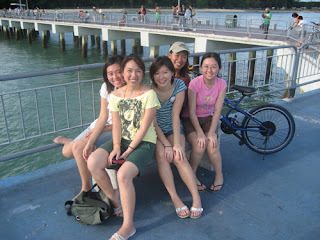 u guys went toward bedok jetty direction right? Cher: We still on our way to Bedok jetty..
Cher: we got many pit stops..see ya at bedok jetty. Wah liew..we were far from Bedok jetty lo..
Not long after we have reached, Cheryl & Rudith had to dash baCK..
One kind lo..they started off earlier than us..yet they only managed to cycle till Bedok Jetty.. They got many pitstops..basically stopped to take foto on interesting stuff..
Not like us..like competing for some competition...hehehehe! The spare ribs damn good! 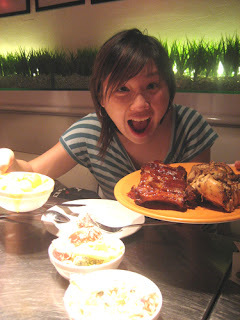 Think is better than the ribs at Cafe Cartel lah! 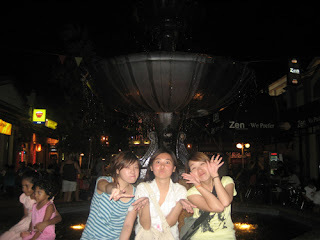 She juz keep taking and taking..
Cheryl, Me & erm...WTH is rainus doing??? Think we shld do it often..
Next month Dragon Gate Buffet!!!!!!!!! Birthday celebrations has always been a MUST to the red dot culture. Our two beautiful ladies - Rowanne & Gladys celebrated their big day!!!! 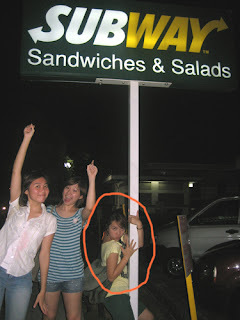 Me & Rowanne & Gladys.. Both are a DEAR to me.. In fact, everyone in red dot, artery & red dot traffic are!!! Rowanne, always known to be Auntie Rowanne will nag on everything.. 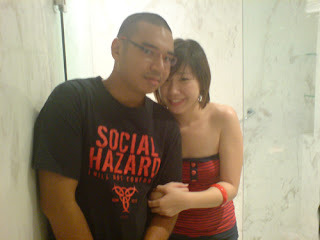 But she teach me alot...always educate me how to handle luv problem..hehehehe! Gladys, is the interesting one..
She is a catholic and she always go vegetarian..
She said that it is to make wish come true..
On her bdae...she din go "vegetarian"....-_-"
hahahaha..but gd thing she made the right choice!!! Then put into ur mouth!!!! My photography skill improved hoh? But everything he pick from the table..he will give me or half half w me..